Mallorca, 251, 08008 Barcelona, Spanien. 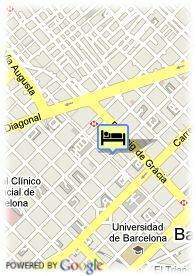 Placed in the best zone of Barcelona, between Passeig de Gràcia and Rambla Catalunya is located the Alexandra Barcelona Hotel. 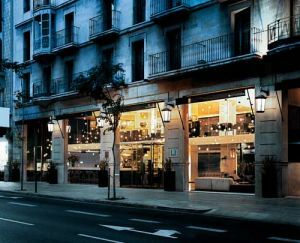 The recently reformed hotel, it is a sample of architecture of forefront of the Barcelona. It has 109 rooms of different styles and categories. Totally equipped with Wifi, air conditioning, office, minibar, TV LCD with more than 300 international channels, direct telephone, free safety box and hairdryer. It has also 4 exclusive meeting rooms to realize all kinds of conventions, meetings and banquets. They have the newest technologies that assure the success of your meeting as soundproofing, air conditioning, detection of fires, screen, Wifi, multiconference, direct line of telephone and all kinds of audio-visual necessary material. Bezahltes überdachter Parkplätze beim Hotel (28.89 €). Stadtzentrum, Museenviertel, in der Nähe der Einkaufszentrum. ältere Kinder und Erwachsene: 75.00 € pro zusätzliches Bett.